An artistic and visually appealing western, Unforgiven is a metaphor for the death of the old west, and a last hurrah for both the genre and the men who made it famous. The Town of Big Whiskey, Wyoming, in the late 1800's: a prostitute at a brothel is slashed repeatedly across the face by two knife-wielding cowboys. The local law, represented by sheriff Little Bill Daggett (Gene Hackman), demands that the cowboys provide horses as compensation, but otherwise the crime goes unpunished. The prostitutes band together and place a $1,000 bounty on the head of the two assailants, much to the dismay of Little Bill, who does not appreciate greedy bounty-hunters from all corners riding into his town. 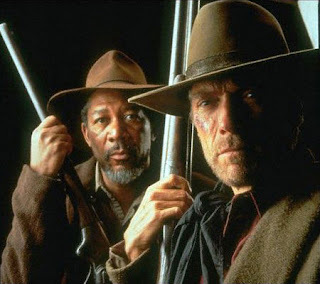 Will Munny (Clint Eastwood) and Ned Logan (Morgan Freeman) are two grizzled outlaws who have long since left their criminal days behind to settle into domesticity. They come out of retirement and team up with The Schofield Kid (Jaimz Woolvett), a brash young gunfighter, for one final job to kill the two cowboys and claim the $1,000 reward. They are soon on a bloody collision course with the sheriff and his men. Unforgiven is beautifully photographed, deliberately paced, and benefits from a dream cast with Eastwood, Freeman and Hackman at its core. It does suffer from a lack of any truly memorable scenes, an absence of wit, and a relatively forgettable music score by Lenny Niehaus. Director Clint Eastwood dedicated the film to Sergio Leone (A Fistful Of Dollars, A Few Dollars More, The Good, The Bad, And The Ugly) and Don Siegel (Two Mules For Sister Sara, The Beguiled), the men whose westerns launched Eastwood's career. While Unforgiven is a visually absorbing experience, the morally suspect message is distracting. The film appears eager to celebrate the lawlessness of the old west, and is dismissive of early attempts to prevent gun crimes and solve violent conflicts by means other than death. The slow pacing provides many opportunities for the characters of Will Munny and Ned Logan to reflect on the demise of their era, but ultimately they are portrayed as heroic for killing men who are attempting to introduce a modern justice system, flawed as it may be. Eastwood therefore positions Unforgiven apart from the westerns of Leone. The Dollars trilogy presented a range of characters all with highly suspect value systems, but there is never any doubt that Leone always parked his sympathies with the least despicable of the lot. In his eagerness to bid farewell to the old West, Eastwood appears to have unsatisfactorily papered over the reasons why it was good thing when men stopped resolving all disputes with six-shooter battles to the death.